Although there is not as much research on the subject, I think there’s sufficient evidence to indicate that trust seals on websites probably will also translate into increased brick-and-mortar visitors. Trust seals or trustmarks and other visual cues are absorbed by consumers online as they are researching to decide which business to go to. If a consumer is comparing two different local businesses, a trust seal could potentially tip the scales if many other factors are similar. We know that store owners are also concerned about various ratings and reviews websites — quite a few businesses even choose to proclaim their great ratings on their webpages by displaying the official ratings badge, such as from Yelp. And simply having a “Zagat Rated” sticker on your restaurant window is likely to increase your walk-in customer traffic for restaurants. 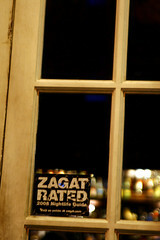 I’m always mildly impressed when I walk up to a restaurant with the Zagat sticker. In districts which have a lot of shopping and restaurants, the Zagat sticker could get more conversions as people walk from eatery to eatery, reading the menus before deciding on a place to dine. For both online and offline, the Better Business Bureau probably has just about the best and widest degree of recognition. I suspect that placing your BBB badge on your site may directly result in increased referrals and increased conversions into paying customers because it increases confidence. Now, is there any evidence that trust seals on websites can improve rankings for local brick-and-mortar stores’ online listing rankings? I don’t know of any study as of yet, but I suspect it would be very hard to isolate such an effect for certain, because I think that many sites which display the seals may tend to already be more-popular and more-successful businesses. Now Google’s Matt Cutts has stated that he considers one of the future issues that’s critical to the future of the internet is the security of webservers (see video below). We know that Google has spent a lot of effort around alerting users who click on pages from sites deemed to be risky, as well as they’ve also alerted webmasters when they sense that their sites may’ve become compromised. So, it’s just possible that Google has pretty good data on whether some of the website security certification services are any good or not, too, and they might choose to use those services’ badges as a signal for trustworthiness of sites. But, there’s no absolute proof that they are doing this. If I were Google, I might choose to add the presence of trust badges into assessments of trustrank and overall popularity assessments. While Google themselves already have a lot of data around whether a site has malware and such on it, they’re open to other security assessment data, and they might also decide that consumers tend to like sites that have such badges more as well. But, you shouldn’t consider it just for search ranking purposes — you should consider it for improving consumer perceptions of your company. This is one way to inspire confidence and impress potential customers. In fact, there are a few different badges that I’d recommend you consider beyond the BBB or industry-specialized badges such as Zagat’s. Some local chambers-of commerce provide member badges, or you could even have your graphic artist manufacture one, if you’re a member of your chamber. Also, there are now green business certifications, fair trade certifications, and more which could enhance your profile in consumers’ eyes. Of course, some of the online trust badges really will not make much sense from a small business’s perspective, since they may be priced more for large online retailers than for a small, local, brick-and-mortar store. This advice is really more for higher-price product retailers and for businesses operating within hotly-contested business verticals. If you’re in a highly competitive business vertical, you just might consider leveraging a trust seal in order to help squeaze every last chance of edging above your competition in the search engine results pages. I could easily see this as being one of the many potential ranking factors in Google Place Search and Google Maps. This entry was posted in Local Search, Offline Marketing, Online Marketing, SEO and tagged BBB, Better Business Bureau, certification badges, certifications, McAfee Secure, quality badges, trust marks, trust seals, TRUSTe, trustmarks by Chris Silver Smith. Bookmark the permalink. Justin, you’re right — many educated consumers know that the barrier for receiving some trust seals is very, very low. That’s why the less-influenced, less-manipulated badges, such as the Michelin star, are considered much more valuable and are far more respected than more easily achieved stuff. But, the open secret is that most consumers are not all that educated, and I suspect there’s a beneficial effect to ratings badges, even when the consumer is totally ignorant of them. I’d love to see a research study which compares recognizable trust seals versus ones which are completely fictional. Absolutely on your second paragraph. 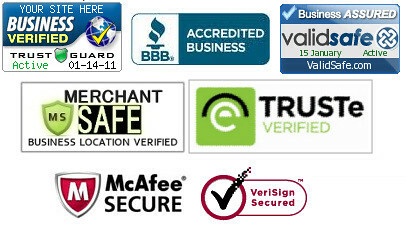 Having badges of almost any kind do mean something to a consumer just looking (even subconsciously) for trust signals. I guess the question would be how would Google – or bing – be able to sort the wheat from the chaff for the non-obvious, non-Michelin memberships? If Google were going to tackle something like this, I’d guess they would acquire a bunch of trust seal organizations to create a user base. But I’m not certain they would charge for the service. Which means everyone and their dog would be submitting their site for trust seal approval. Do you think if every site had trust seals, the value of having them would be decreased? A late comment to this post but what a brilliant article. Perhaps usability professionals could shed light on the effectiveness of such seals? I think trust seals could go a lot further in what they cover however, As an internet marketer I would happily pay to be part of a respected trade body that monitor what I do and deem me qualified to offer online marketing services to other business’s. This would be more of a business to business offering as opposed to gaining consumer confidence but I see both as being important. Back in the day when I sold yellow page advertising, I’d tell my customers there are 3 things every ad must answer. 1) What you can do for me? 2) Why I should trust you/have confidence in you? 3) Why will it be easy to do business with you? Most neglected at least one of the things – usually the trust/confidence factor. Businesses still need to answer those questions for consumers. Yes I think it is a good thing that Google’s trust rank has outdone the page rank relevance. Hey look what has just happened to the article directories with the recent Google Panda update. Great article. I’m a rep for a design agency that works with lots of small privately funded startups. A few of these clients have had success with the VeraSafe seal, which is less expensive than the ones mentioned in the article. Its a good option if your on a budget but still want to take advantage of what a seal can do for your site.